Good: Part of my apartment was painted yesterday and will continue today (yay!). Bad: The empty china cabinet & TV unit (with contents scattered over every open surface in my place), downed photo frames, and moved furniture kinda makes me look like a hoarder. Good: I ran a 5K on Sunday and am super sore. Bad: Yep, I'm so out of shape that not only am I sore, but I have some sick shin splints to boot. Today I'm back with my holiday gift guide (which is really just my own excuse to Internet shop for my imaginary Christmas list and then share it with all of you). Today's guide is all about glitter, sequins and metallics...all things I love around holiday time! I own 2 pairs of TOMS and love every moment of them. They are always so comfy and look cute to boot. The glitter version is even more adorable since it takes the whole look up a notch. I could see these paired with black skinny jeans and a sweet top for a more casual holiday party with a little flair! And for $54 they hardly break the bank, so they also make a fantastic and fun gift. This gorgeous set of nail polish falls into the category of 'I probably wouldn't buy it for myself, but would be thrilled to receive it' kind of gift. 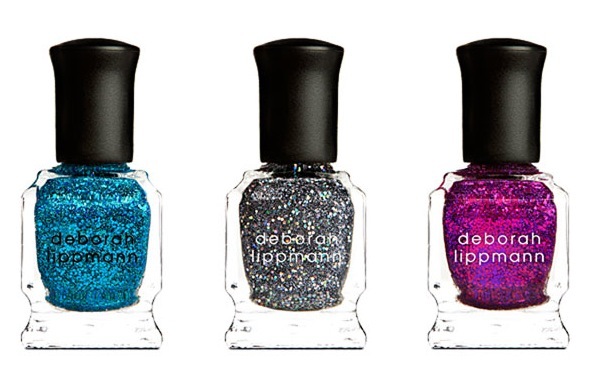 Though these are minis, the entire set falls at $29 which is a steal for Deborah Lippman polish. These colors are so fun and festive and simply perfect for a New Year's Eve party...or even just to make the work day a little more exciting! I really love this dress. The top is simple, the bottom is gorgeous and the color is perfectly blue-gray. My favorite aspect is that the top is a big baggy while the bottom is super short, as every cocktail dress should be. This is a perfect pick up for pre-holiday parties, but also as a holiday gift! Who doesn't need/want a go-to sequin dress for winter parties? My heart fluttered a little when I spotted these crystal & metal bangles. I love love love bangle bracelets (and often layer my own collection of bangles and bracelets together). These are so chic, so gorgeous, and come in a variety of colors. 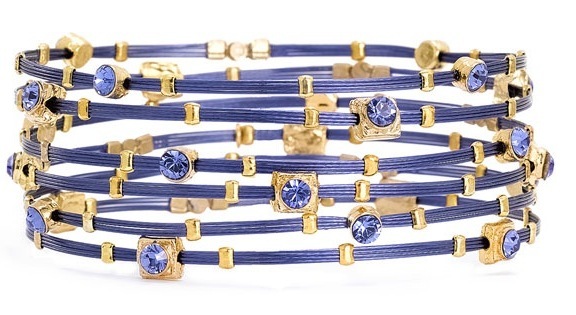 Not surprisingly, my favorite is blue :) A bit on the pricier side at $98, but for more of a splurge, I like. Oh man, how cute is this pouch? 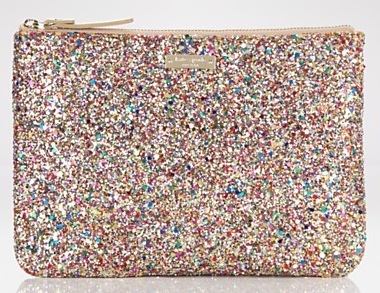 I could see using it as a mini clutch through the holiday and winter season. Just big enough for a phone, credit cards, a few bills and a lipstick, this is just a fun piece. I love the multi-colored glitter bits...it could match with just about anything! So there you have it. All my coveted glitz & glam pieces for this holiday! Do you ever rock pieces with glitter or sequins? I am trying to do more! Mine is a cinch waisted dress from last holiday & my glittery spike heels!